Now 16 and living with her drug-using, abusive mother, Apple decides she wants out: out of the system, out of the streets, out of her abusive and unpredictable living situation, out of despair. She clings to the only lifeline she has left, a letter written to her by the father (Brenden Frasier) she has never met. Even though she doesn't know him, she finds hope in the words written to an unborn child by a young man 16 years earlier. Because there are two other needs that human beings have over and above the five essentials, something Apple finds in the letter she has treasured her whole life from a man she doesn't know. Research and experience has proven that without these our bodies might continue to exist, but our human essence will wither and even die. 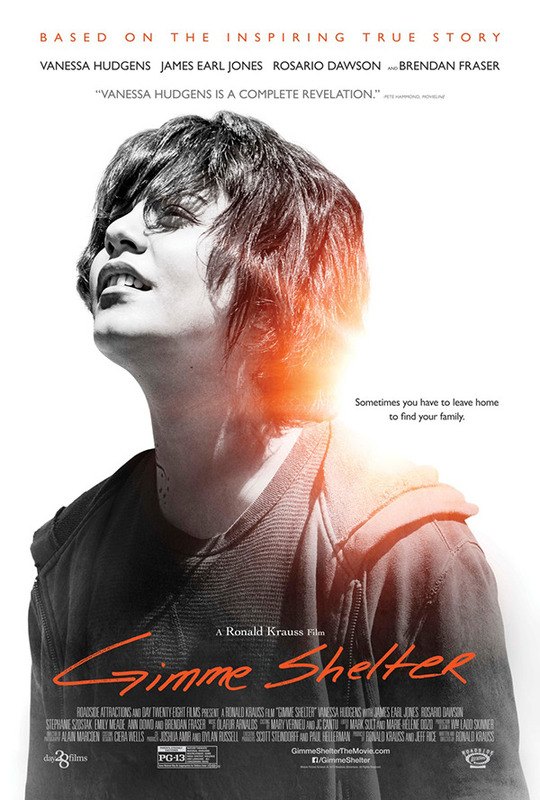 Based on a combination of true stories, "Gimme Shelter" is the story of Apple's journey from mere survival in a gritty tenement to discovering the father she thought she would never know and finding a full life as part of a most unconventional family. Apple escapes her abusive home environment and finds her father, now a wealthy Wall Street broker with a wife and two small children. Remarkably, he welcomes Apple into his home despite her rude ways and defensive attitude. Rebuffed by Apple's mother when she learned she was pregnant, he has always longed to know his first child and is eager to help her in anyway he can. However, after finding out Apple is pregnant, he encourages her to have an abortion for her own sake. She agrees. It makes sense. She is only 16, uneducated, unemployed, and unprepared to be a mother. She and the baby's father are not together. And the last thing she wants is to follow the path her mother took. But while waiting at the clinic, she looks at the ultrasound pictures she has kept hidden in her shoe. She cannot go through with it. Even though it's crazy and makes no sense, she wants to keep her baby. And no one is going to tell her what to do. She runs away from the abortion clinic and wanders the streets alone. She seeks shelter in doorways as night falls, and finally finds an unlocked car where she can hide from the rain and the dark. She scrounges for crumbs left in a plastic bag before crawling into the back seat. As she looks at the ultrasound picture of her unborn child, she cries herself to sleep comforted by the blanket of a stranger. Amazingly, in the morning her situation becomes more desperate. Pursued by thugs, Apple steals their car in an attempt to get away. Like every other attempt Apple has made to escape one bad situation, she ends up in one that seems worse. She crashes the car and wakes up in the security ward of New York City Hospital, handcuffed to the bed and in the presence of the hospital chaplain, Father Frank (James Earl Jones). As Father Frank prays at Apple's bedside, she dismisses him. "I don't need a priest, God don't care about me. Last time I asked for His help, He put me here." "He's a tough CO at times, but maybe...you're exactly where you're meant to be," Father Frank replies. Eventually he wins Apple's trust and tells her of a special shelter for teens who want to keep their babies and need a place to live. At first she refuses. After a visit from her mother - and her social worker - she knows that going home (if you can call it that) is not an option for her. She agrees to visit the shelter. The shelter is just what Apple needs. Founded and run by loving but tough Kathy DiFiore (based on the actual founder and played by Ann Dowd), the shelter offers all the basic needs plus the discipline and unconditional love craved by these young unwed mothers from difficult circumstances. Here Apple finds comfort and caring from both the house mothers and from her new-found peers. After her daughter is born, Apple finally accepts her father's offer to come and live with his family. But as she prepares to leave the shelter with her baby and return with him to live in the new wing of the house built just for her and her child, she discovers that she cannot leave the one place where she finally felt she belonged. She tells her father that she cannot go with him yet, explaining, "It's crazy how you can go and live with strangers and feel so much joy.. and not feel unwanted...feel like you can go places ...and succeed in life." For the first time Apple knows what it is like to be truly loved and accepted for who she is. The lessons she learns and the strength she gains from the strong sisterhood surrounding her give her the resolve to leave the past behind and plan a future for her and for her child. Featuring a deeply moving and convincing performance by Vanessa Hudgens, the film was conceived, directed and produced by Ronald Krauss. Krauss spent a year living in the shelter and recording hours of interviews, including the young woman on whom Apple was partially based. While the film is geared towards pro-life audiences, it also should serve as a reminder that the basic needs of life are more than just food and water, that the ability to breathe means more than just air, and that shelter consists of more than just four walls and a floor to protect us from the elements. It also illustrates that a "pro life" stance should be about more than just helping young women avoid undesired abortion. It should be about helping them escape their circumstances and providing them with the unconditional hope and love required to find the fullness of life that most of us take for granted.